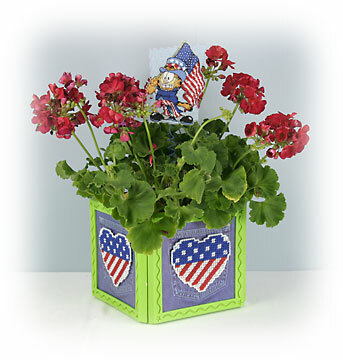 Create a patriotic planter with plastic-canvas flag hearts and a cross-stitch plant stake. The planter from Dimensions is assembled from inexpensive mat board or painted cardboard. Find this craft and more plastic canvas projects in 25 Free Patterns for Plastic Canvas. Cut five 7" squares from the cardboard. Construct a box (sides and bottom) with the squares, using masking tape to hold the pieces together. Glue the plant stake or wire to the back of the counted cross stitch design. If you are using wire and want to add curlicues, bend the wire around a pencil several times. It his is a nice little planter with great instructions. I could see adding a red, white and blue crossgrain ribbon around it and perhaps glue some glittery rhinestones to it f some extra bling! This planter would be a nice house or hostess gift when invited to a neighborhood party or very lovely to have on your patio anytime!